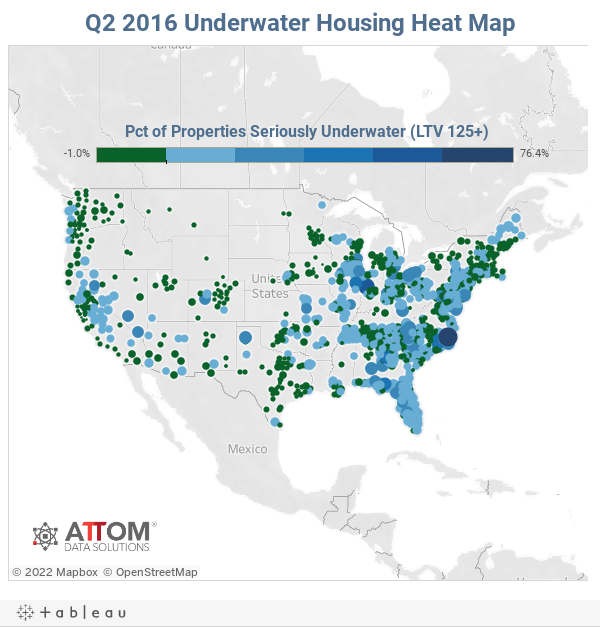 More than 263,000 New Jersey properties are considered "seriously underwater," meaning the homeowner owes at least 25 percent more on the mortgage than the home is worth, in a new report from ATTOM Data Solutions. It's a situation that affected 14.8 percent of New Jersey properties with a mortgage in the second quarter of 2016, according to the report, and that's practically unchanged from the same quarter last year. While the nation as a whole saw seriously underwater properties decrease by more than 37,000 from the quarter prior, New Jersey experienced a jump of more than 8,800. "New Jersey is still struggling because of tepid home prices there compared to other markets," said Daren Blomquist, senior vice president with ATTOM Data Solutions, the parent company of RealtyTrac. "While much of the country is seeing home prices recover and bounce back, there are markets that are being left behind." Even within New Jersey, the numbers show where economic struggles continue to linger from the end of last decade. A handful of New Jersey counties registered an underwater rate greater than 20 percent. Atlantic County's rate jumped from 26 percent to 33 percent in the matter of a year. "For homeowners who are still underwater, really the path back to equity is primarily through time and seeing their home value appreciate over time as the market slowly but surely recovers," Blomquist said. Just 4 percent of homes with a mortgage in Middlesex County are considered seriously underwater, according to the report. On the opposite end of the spectrum, nearly 21 percent of New Jersey homes with a mortgage are considered "equity rich," meaning the homeowner has at least 50 percent equity. Cape May County leads the way in that category.